Chartres Tours from Paris Include: Our Chartres tours include private driver guide, private transportation to and from your hotel, taxes, tolls and parking. 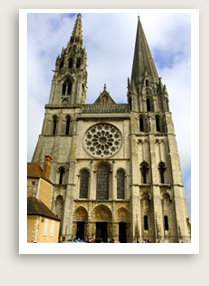 Not Included in Chartres Tour Price: Entrance fees to Chartres sites you choose to visit. NOTE: A expert guide for the cathedral is available at additional cost. Inquire. You may extend your half day tour. Full day tours of Chartres is available. Let Well Arranged Travel take you on a day trip from Paris to Chartres. Enjoy a private tour of Chartres and its magnificent Gothic cathedral, the largest cathedral in France known for its stained glass windows and medieval labyrinth. This is a wonderful day tour from Paris. Chartres is a charming old city which features the famous cathedral, a UNESCO World Heritage site. Your Chartres private tour will give you a taste of its historical treasures, from the Chartres cathedral’s labyrinth, its many museums, including one for tapestry and mosaics. The tertres (steep lanes and stairways) of Chartres make for a vigorous walk about town. Chartre’s old town is a wonderful place to explore and have lunch. Your Chartres private tour can be extended into a full day tour to explore more of this lovely historic town and its many inviting shops, artisan’s studios, and churches.